MD8000 platform users can now transport 4K UHD-1 video signals across their networks. 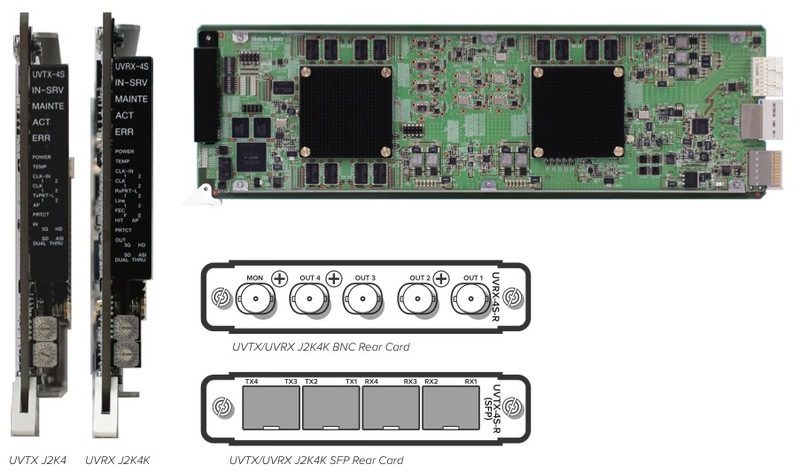 To transport 4K UHD-1 video signals, the MD8000 platform utilizes the UVTX/UVRX line cards configured for JPEG 2000 compression. Four separate, correctly timed 3G-SDI video signals are required for input to the UVTX line card, which compresses via JPEG 2000 and then subsequently IP packetizes (conforming to SMPTE 2022) for transport as a single service. The UVRX card de-packetizes and decompresses the four video stream signals, presenting four correctly timed 3G-SDI video outputs. Forward error correction, hitless switching and auto-protection are all provided as part of the MD8000 transport operation.